Aerodynamicists use wind tunnels to test models of proposed aircraft and engine components. During a test, the model is placed in the test section of the tunnel and air is made to flow past the model. Various types of tests can be run in a wind tunnel. Some tests are performed to directly measure the aerodynamic forces and moments on the model. The most basic type of instrument used in this type of testing is the force balance. To measure the force, we use some type of mechanical or electrical system whose output changes when a force is applied to the system. Modern wind tunnels typically use electrical strain gages to determine forces on the model. Multiple gages can be used to determine all the three forces and three moments. 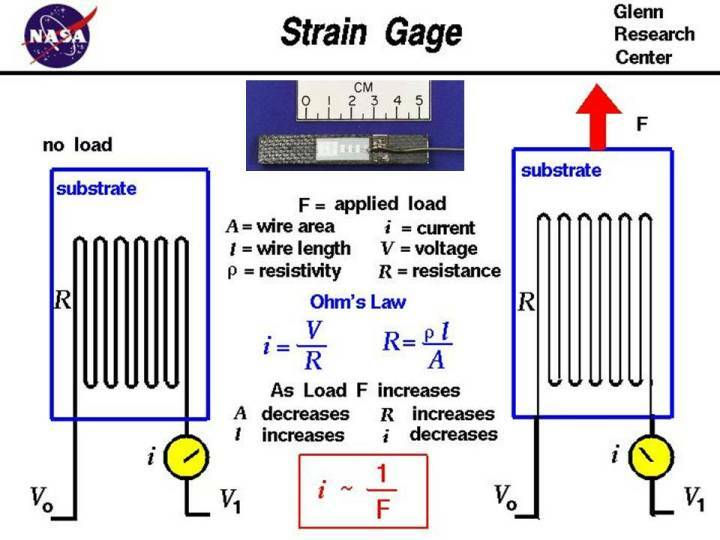 On this web page we will examine the operation of a strain gage. Stretching the wire changes the resistance in the wire which changes the output current for the circuit. After calibration using a known amount of force, the output current is inversely proportional to the applied force F.
We now have an instrument that can be used to measure the force in either an external or internal balance. There are however some conditions that must be carefully monitored to insure an accurate measurement of force. The assumption is made that the stretching of the wire is the same as the stretching of the substrate. This is only true as long as the wire is rigidly attached to the substrate. Care must be taken in building, operating, and handling of the gage to insure that the wire stays attached to the substrate. The substrate and wire can also be "stretched" by heating of the element. The change in length of the wire due to heating is registered as an applied force when no force is applied. To eliminate the temperature effects on the gage, multiple gages are typically attached to the model in a Wheatstone bridge circuit. The operation of the Wheatstone bridge circuit is given on another page.